© Ibrahim Alnaami; Licensee Bentham Open. Brain tumours that are associated with cerebral aneurysms are rare occurrences, whereas the coexistence of brain tumours and intra-tumoural aneurysms is even rarer. There have been 12 brain tumour cases that have been reported in the literature that describe an aneurysm within a brain tumour, with 4 of these tumours being meningiomas. A 34-year-old male patient presented with sudden-onset headache, and an inter-hemispheric meningioma with intra-tumoural bleeding was found due to a ruptured embedded anterior cerebral artery aneurysm. The aneurysm was diagnosed incidentally on the third cerebral angiogram, while the initial 2 angiograms were negative. The patient was treated with endovascular aneurysm embolisation that was followed by tumour resection. This paper is the first case report to describe the coexistence of a meningioma and an aneurysm, which presented with intra-tumoural haemorrhage that was negative on the initial cerebral angiogram. Unlike previous case reports, the aneurysm in this case was located with an anterior cerebral artery distribution. Keywords: : Meningioma, Haemorrhage, subarachnoid haemorrhage (SAH), aneurysms, computed tomography, Brain magnetic resonance imaging (MRI). The incidence of the coexistence of brain tumours and aneurysms has been estimated to be 0.2–0.7% . The association between a meningioma and intra-tumoural bleeding due to a ruptured embedded aneurysm was first reported by Kandel et al. in 1986 . Patients with meningiomas and embedded aneurysms may present with a subarachnoid haemorrhage (SAH) or tumour/haemorrhage mass-effect symptoms . Meningiomas with intra-tumoural bleeding due to ruptured aneurysms have been reported in association with the middle cerebral artery (MCA), the anterior communicating artery, and the internal carotid terminus . We describe an inter-hemispheric meningioma with intra-tumoural haemorrhage due to a ruptured distal anterior cerebral artery aneurysm. A 34-year-old male was suffering from a mild headache and had difficulty sleeping for a month prior to his admission to hospital. In addition, he complained of difficulty in focusing his thoughts. Early in the morning of the day he came to the hospital, he said that he woke up with the worst headache of his life. He had no other neurological symptoms, and his past medical history was unremarkable. In the emergency department at the University of Alberta Hospital, the patient was in pain, but he was otherwise haemodynamically stable with a Glasgow Coma Score of 15 and no neurological deficits. A computed tomography (CT) scan revealed a rounded mass of 3.3 cm within the intra-hemispheric region, and it was associated with acute haemorrhage, which was predominantly in the right postero-medial frontal area (Fig. 1A). Therefore, the patient was admitted to the neurosurgery step-down unit for monitoring. A cerebral angiography revealed displaced peri-callosal arteries on both sides with mild opacification of the midline lesion from a distal branch of the left middle meningeal artery. No associated vascular abnormalities were observed (Fig. 2A). Axial computed tomography demonstrates an acute inter-hemispheric haemorrhage. B) Sagittal T1-weighted sequence. C) Axial post-gadolinium T1-weighted sequence. D) Coronal post-gadolinium T1-weighted sequence, indicating tumour location. The initial negative conventional cerebral angiogram of the left internal carotid artery. B) The pre-operative angiogram of the same vessel when the aneurysm was found (arrow). C) The aneurysm was visualised more minutely with an angiographic micro-catheter that was injected in the left anterior cerebral artery. Brain magnetic resonance imaging (MRI) with and without contrast revealed an intra-hemispheric falcine enhancing extra-axial mass that measured 3.8 × 3.2 × 3.6 cm. The most likely diagnosis was a meningioma. The mass itself was composed of 2 components. One enhancing component was present in the middle and left portions of the tumour, which was iso-intense to grey matter in all sequences. Along the right lateral margin, there was a nonenhancing component, which was dark on T2-weighted sequences and contained multiple foci of increased T1 signal. This was in line with a haemorrhage (Fig. 1B, C, D). During his stay in the hospital, the patient’s clinical condition remained stable, and second conventional angiogram was obtained, which revealed no vascular abnormalities that differed from those in the previous study. Because MRI revealed significant swelling around the haemorrhage, a delayed elective surgery was planned. The patient was then discharged home with steroids and anticonvulsants. Four weeks later, a pre-operative cerebral angiogram, which was conducted for the purpose of tumour embolisation, did not reveal any appropriate targets for embolisation; rather, a 3-mm saccular aneurysm was noticed with a left internal artery injection from the distal left pericallosal artery (Fig. 2B, C). On the next day, with the patient’s consent, an endovascular embolisation of the aneurysm was performed with N-butyl-2-cyanoacrylate, and no complications were encountered. On the following day, the patient underwent a surgery for resection of the tumour. The craniotomy was performed through a bifrontal incision. The tumour was midline attached to the falx. Normally we would prefer a midline approach from the nondominant side (right side). However, there were two large bridging veins on the right side and a clear corridor on the left. We approached the tumour from the left. The tumour was evident within one centimeter of the cortical surface. There was obvious hemosiderin staining around the tumour posteriorly, however the tumour was easily dissected from the surrounding brain without significant adherence. At the deepest margin of the tumour the pericallosal arteries were embedded within the tumour base. As a result a small rim of tumour was left attached to the preserved pericallosal vessels. The patient was discharged home 3 days after the procedure, and a follow-up cerebral angiogram showed no recurrence of the aneurysm. The final pathology confirmed the diagnosis of a World Health Organization grade-I meningioma with embolisation material within the tumour (Fig. 3). Micro-photographs showing histopathologic findings. A) A meningioma with meningothelial features, fresh haemorrhage and hemosiderin deposition (brown colour, suggestive of previous haemorrhage). B) An aneurysm (arrows pointing to the neck) at the wall of a muscular artery. 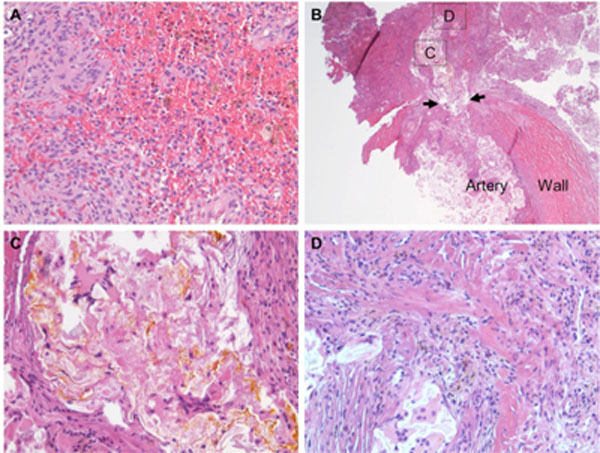 C) The site specified in B) showing aneurysm embolisation N-butyl-2-cyanoacrylate material (yellow colour) and surrounding reactive changes, including multi-nucleated giant cells. D) The site specified in B) showing aneurysm rupture with surrounding hemosiderin deposition. Original magnification 200×, A, C and D; 25×, B.
Fischer et al. reported 95 cases of coexistent meningiomas and aneurysms. They collected 12 cases of cerebral intra-tumoural aneurysms that were published prior to 2009, and 4 of those 12 cases were meningiomas. Kandel et al. published the first case of a 7-year-old girl with a SAH from a MCA aneurysm that was encased inside the right fronto-temporal meningioma, and both pathologies were treated surgically. Tancioni et al. reported a case of a 48-year-old woman with a left fronto-temporal meningioma and left MCA aneurysm. In 1999, Ogino et al  published a report of a 70-year-old female patient who presented with a SAH from an anterior communicating artery aneurysm, which was encased in a sellar meningioma. The most recent case, which was published in 2009 by Fischer et al. , was a 44-year-old female who was admitted for persistent headache and who was found to have a left sphenoid wing meningioma with a left internal carotid artery terminus aneurysm embedded within it. In all of the aforementioned cases, the aneurysms were seen on the first angiogram, and all were found in locations that are common for aneurysms. In our case, 2 initial angiograms proved negative, and the aneurysm was found only on the third angiogram that was done for tumour embolisation purposes. The negative angiograms may have resulted either from haemorrhagic obliteration of the aneurysm or clot compression of the ruptured aneurysm, which would have decreased the sensitivity of conventional angiography. There have been numerous hypotheses that have tried to explain the coexistence of meningiomas and aneurysms. Pia et al. have proposed that vascular meningiomas with associated increased regional blood flow might explain the association of aneurysms with meningiomas. However, Kandel et al. have suggested that meningioma adhesions to the arterial adventitia might cause damage to the arterial wall, resulting in aneurysm formation. However, the underlying mechanisms remain unclear. One thing that is certain is that the coexistence of aneurysms and meningiomas has important implications in clinical diagnosis and treatment, and endovascular treatments of aneurysms might be pursued as a first step in enhancing the visualisation and safety during operative dissections . However, whether an angiogram should be obtained for all patients with meningiomas with associated haemorrhages remains controversial. If intra- or peri-tumoural haemorrhages are identified on pre-operative imaging, then a conventional angiogram should be considered. When conventional angiography is obtained for pre-operative embolisations, aneurysms should be ruled in or out. The present case is the first of its kind to demonstrate the coexistence of a meningioma and an anterior cerebral artery aneurysm rupture, where the aneurysm was encased in the meningioma. Two angiograms were negative, but the third exhibited the meningioma with intra-tumoural bleeding from the ruptured aneurysm. Kandel E, Ludkovskaya I, Dobjansky N. Aneurysm inside meningioma. Case report Acta neurochirurgica 1986; 81(1-2): 72-6. Fischer BR, Palkovic S, Holling M, Niederstadt T, Jeibmann A, Wassmann H. Coexistence of cerebral aneurysm and meningioma--pure accident? Clinical neurology and neurosurgery 2009 Oct; 111(8): 647-54. Tancioni F, Egitto MG, Tartara F. Aneurysm occurring within a meningioma: case report British journal of neurosurgery 1998 Dec; 12(6): 588-91. Ogino M, Nakatsukasa M, Nakagawa T, Murase I. Ruptured anterior communicating artery aneurysm encased in a tuberculum sellae meningioma. Case report Journal of neurosurgery 1999 Nov; 91(5): 871-4. Pia HW, Obrador S, Martin JG. Association of brain tumours and arterial intracranial aneurysms Acta neurochirurgica 1972; 27(3): 189-204.